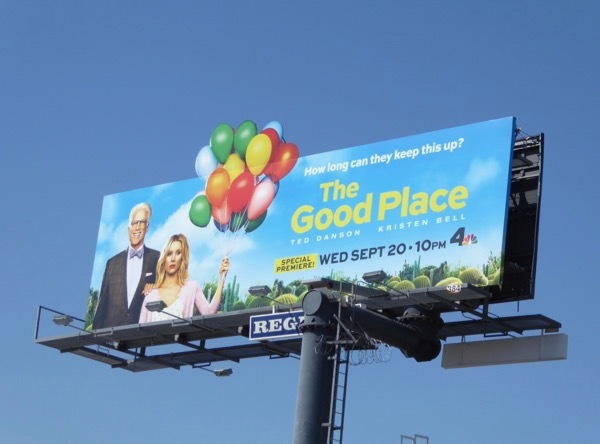 'Pennywise' the terrifying clown from IT isn't the only balloon-loving character in the skies of L.A. of late, as Kristen Bell's 'Eleanor Shellstrop' returns for a second season of The Good Place with a colourful floating assortment all her own. 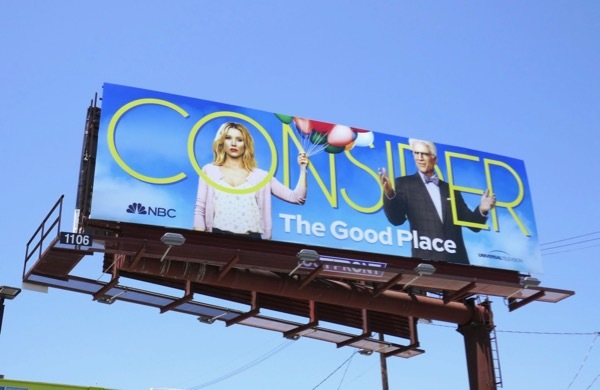 At the end of the show's first season we discovered that she wasn't actually living in the heavenly afterlife at all, but actually a hellish place designed to torment her and William Jackson Harper's 'Chidi', Jameela Jamil's 'Tahani' and Manny Jacinto's 'Jason' because of their contrasting and conflicting personalities, created by Ted Danson's devilish architect 'Michael'. 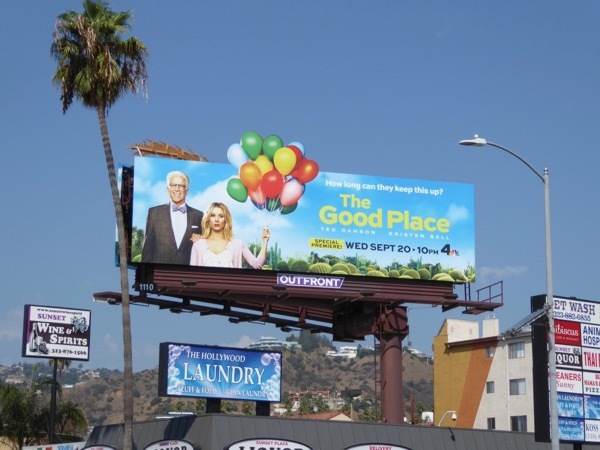 These special extension balloon cut-out billboards for the sophomore season of The Good Place certainly help make the returning comedy stand out in L.A.'s skies and were photographed along Sunset Boulevard and Beverly Boulevard from September 6 to September 10, 2017. 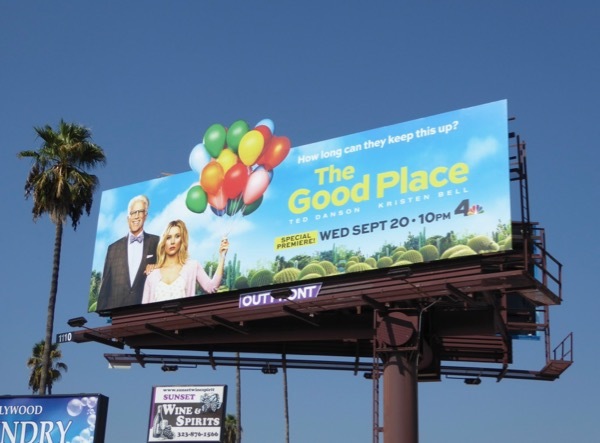 For more fun balloon-themed billboards, you can also check out these Crazy Ex-Girlfriend billboards, these IT movie billboards, these Deadbeat billboards and these billboards for The Mindy Project. 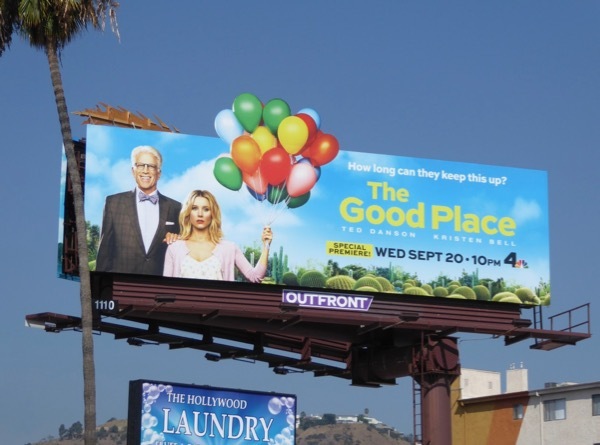 Eleanor spent the first season hiding the fact that she didn't think she deserved to be in The Good Place and trying to turn over a new leaf so she could stay, but when they all discovered the truth about this underworld experiment it was reset and their memories wiped. Will her quick thinking (placing Chidi's name on a note in artificial aide 'Janet's' mouth) allow her to discover the reality of her situation again, after all how long can they keep this deception up? 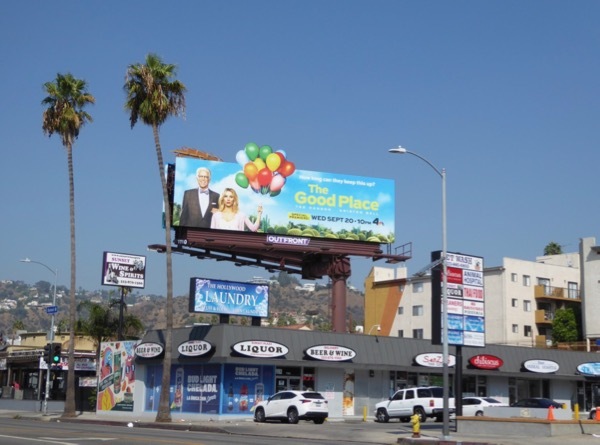 UPDATED: Here's also an Emmy consideration billboard for the sophomore season spotted along Santa Monica Boulevard on June 1, 2018.